On Tuesday, January 15, Heritage Auctions in Dallas will sell the John Silverstein Collection of African American Social History, in 383 lots. James Van Der Zee’s Eighteen Photographs (1974), a portfolio of photographs taken between 1905 and 1938, has an opening bid of $8,750. A collection of more than a hundred letters from Charles A. Hill to his wife Lydia relating to his Civil War service in the 1st Regiment Infantry, U.S. Colored Troops has a reserve of $7,500. A poster believed to be the first use of black panther imagery, issued for a voter drive in Lowndes County, Alabama and predating the formation of the Black Panther Party, is currently bid up to $4,200. A collection of forty-one issues of the National Anti-Slavery Standard has an opening bid of $2,000. Kestenbaum & Company holds an online sale of Printed Books, Holy Land Maps, Posters & Jewish Graphic Art on Thurday, January 17. The 173 lots include a 1917 poster issued as part of a campaign in which Russian Jews were to be allowed to elect members of their own Congress ($4,000-6,000) and a 1929 poster for the second lottery held by OZET, the Society for Settling Toiling Jews on the Land ($3,000-5,000; pictured). A copy of the 1518 Basle edition of Trithemius’ Polygraphiae also rates a $3,000-5,000 estimate. At $2,000-3,000 we find a four-sheet copy of the Tabula Peutingeriana, showing the layout of the roads of the Roman Empire. A number of early printed books and a good selection of maps to be had in this sale. Among the 484 lots in the Collection of Anne H. & Frederick Vogel III, to be sold at Sotheby’s New York on Saturday, Janaury 19 there are a few Audubon plates, including the Ivory-Billed Woodpecker ($50,000-80,000); the Fish Hawk (Osprey) at $30,000-50,000; and the Ruffed Grouse ($20,000-30,000), among others. A framed copy of the fourth state of John Smith’s map of New England is estimated at $20,000-30,000, as is a copy of the second edition of William Wood’s New England’s Prospect. On Tuesday, January 15, Heritage Auctions in Dallas will sell the John Silverstein Collection of African American Social History, in 383 lots. James Van Der Zee's Eighteen Photographs (1974), a portfolio of photographs taken between 1905 and 1938, has an opening bid of $8,750. A collection of more than a hundred letters from Charles A. Hill to his wife Lydia relating to his Civil War service in the 1st Regiment Infantry, U.S. Colored Troops has a reserve of $7,500. A poster believed to be the first use of black panther imagery, issued for a voter drive in Lowndes County, Alabama and predating the formation of the Black Panther Party, is currently bid up to $4,200. A collection of forty-one issues of the National Anti-Slavery Standard has an opening bid of $2,000. Kestenbaum & Company holds an online sale of Printed Books, Holy Land Maps, Posters & Jewish Graphic Art on Thurday, January 17. 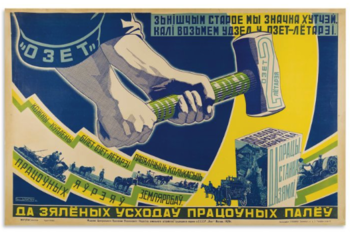 The 173 lots include a 1917 poster issued as part of a campaign in which Russian Jews were to be allowed to elect members of their own Congress ($4,000-6,000) and a 1929 poster for the second lottery held by OZET, the Society for Settling Toiling Jews on the Land ($3,000-5,000; pictured). A copy of the 1518 Basle edition of Trithemius' Polygraphiae also rates a $3,000-5,000 estimate. At $2,000-3,000 we find a four-sheet copy of the Tabula Peutingeriana, showing the layout of the roads of the Roman Empire. A number of early printed books and a good selection of maps to be had in this sale. Among the 484 lots in the Collection of Anne H. & Frederick Vogel III, to be sold at Sotheby's New York on Saturday, Janaury 19 there are a few Audubon plates, including the Ivory-Billed Woodpecker ($50,000-80,000); the Fish Hawk (Osprey) at $30,000-50,000; and the Ruffed Grouse ($20,000-30,000), among others. A framed copy of the fourth state of John Smith's map of New England is estimated at $20,000-30,000, as is a copy of the second edition of William Wood's New England's Prospect.